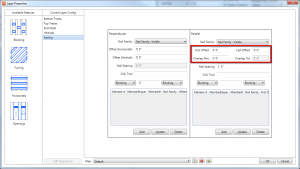 BC Calc - Wood floor joists can now be designed with Boise Cascade’s BC Calc. This engine also has the capability of picking up the right size Simpson Strong-Tie hangers and displaying them in the MWF Floor model. BC Calc generated reports are also available to be viewed and saved in MWF Floor. Wall shop drawings – New options for dimension placement in the top/bottom framing view. Multilayer- Parallel Nailing - Option for a bottom offset, running offset, and also top offset now included. Clash Detection – Structural elements can now be clashed against arched walls for the creation of openings. 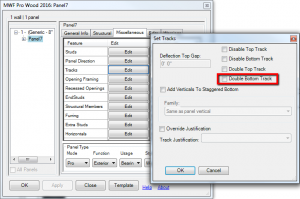 Panel Properties - Double Bottom Track – New option to add a ‘Double Bottom Track’ on a panel. Revit Content Update – Main families and templates were updated to the lowest supported version (2016). This will reduce time in loading data and other settings. 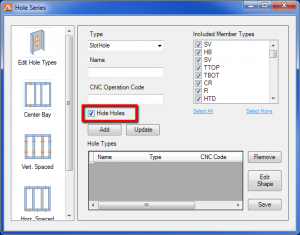 Hide Holes option in Hole Series – CNC information can still be sent to an output file without visually creating the holes in the members. 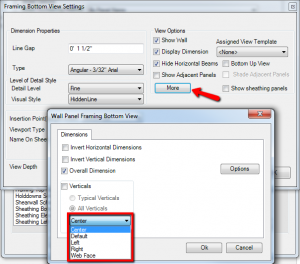 This option was added to avoid increasing significantly the size of the Revit file that uses “Hole Series” for CNC machine outputs.